Have you always wanted to climb a frozen waterfall. 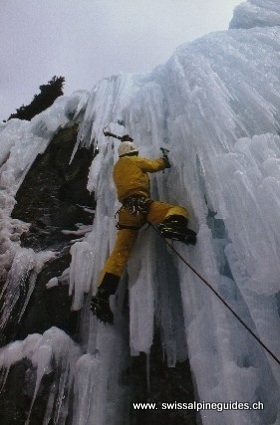 We make it easy for you by providing everything you require to start climbing including warm gear. Just sign up and join the fun.. Under the guidance of our UIAGM qualified mountain guides, you will learn top tips and tricks in the fascinating world of ice climbing frozen waterfalls. Excel in this exciting sport, climbing frozen waterfalls. Full instructions will be given by our qualified swiss mountain guides.